Exercise 5 Aim: Preparation of temporary slide of animal tissues and their study. Principle: Group of similar type of cells that perform a specific function, is called a tissue. Tissues are organised in a specific proportion and pattern to form different organs. There are four basic types of tissues : (i) Epithelial, (ii) Connective, (iii) Muscular and (iv) Nervous. The epithelium or epithelial tissue provides a covering or lining for some parts of the body. Connective tissues have special function of linking and supporting other tissues or organs of the body. Muscular tissue plays an active role in all movements of the body. Nervous tissue controls the body's responsiveness to changing conditions within and outside the body. Requirement: Live material/concerned tissue, beakers, glass slides, coverslips, watch glasses, dropping bottle, dropper, required stain, glycerine, NaCl solution (0.9% w/v), needle, forceps, brush, toothpick, water, wash-bottle, dissecting tray, microscope. I. EPITHELIUM OR EPITHELIAL TISSUE • Rinse your mouth well with water. • Gently scrap the inside of your cheek with the broad end of a clean toothpick. Discard this material. • Scrap again, and spread these cells gently on a clean slide. Add a drop of 0.9% NaCl solution or physiological saline and a drop of methylene blue with the help of a dropper. • After two minutes, remove the excess stain and saline using the edge of a filter paper. Now, put a drop of glycerine on the cells. • Place a coverslip over the tissue and gently press it with the back of a pencil to spread the cells. • Examine the slide under the low power of microscope. • Draw a labelled diagram of your preparation. Laboratory Manual: Biology Record your observations in the tabular form given below: Features 1. No. of cells in a focus 2. Shape of cells 3. Nature of cell boundary 4. Nucleus: present/absentshape-location- Observations Epithelial tissue (epithelium) forms the covering tissue of the body. It covers the body surface and lines the body cavities and hollow visceral organs. It may be single or multi-layered. The lower most layer normally rests upon a non-cellular basement membrane. It is protective/sensory/absorptive/and secretory in nature and also helps in exchange and movement of materials inside the body. II. CONNECTIVE TISSUE • Clean the slides so that it become free from grease, finger prints, etc. • Clean the tip of your middle finger with rectified spirit and prick with a sterilised needle or lancet available at the medical store. • When a drop of blood appears on the finger tip, wipe it away with cotton dipped in rectified spirit. • Press the finger tip to get the next drop of blood and touch it with the clean surface of slide (placed on working-table) (Fig 5.1 (a)) about 1 cm away from the right side edge (this be named as the first slide). • Hold the narrow edge of another slide (2nd slide) at about 450 angle to the 1st slide and to the left of the drop of blood (Fig. 5.1(b)). • Pull to the right until the 2nd slide touches the blood. Wait for 2-3 seconds till the blood spreads along the line of contact. Now push the 2nd slide towards the left in a steady but brisk movement. Take care to keep the edge pressed uniformly against the surface of the 1st slide. Keep pushing until the other end of the slide is reached (Fig. 5.1 (c)). This method spreads the blood thinly (also called a blood film) over the surface of the slide but does not run over the cells and crush them. You may make 3 or 4 such film (smear) preparations. • Once the uniform smear is made, air dry the slide for about 10 minutes. Exercise 5 • Mark with a wax pencil the region of the smear that is to be stained. • Cover the region marked with wax pencil with few drops of Leishman's/ Geimsa/Wright's stain. Leave the stain over the smear for 2 to 3 minutes. Now, add an equal amount of distilled water gently with a dropper and leave it for 2 to 4 minutes. Repeat this process till its colour becomes light violet. Air dry the slide thoroughly and mount with a cover slip, using a drop of glycerine. • Observe the slide under a compound microscope first under low magnification and then at higher magnification. (i) Every student is required to use separate sterile needle (preferably disposable) to avoid any infection. (ii) Do not allow the stain to dry. For this, the slide may be covered by a watch glass/petridish. Your observations under the microscope should enable you to draw the red blood corpuscles (RBC’s) of human blood. RBCs (erythrocytes) are biconcave, circular and non-nucleated. Observe carefully the various types of white blood corpuscles (WBC’s), the eosinophils, the basophils and neutrophils. Also observe the blood platelets (Fig. 5.2). Draw a labelled diagram of different types of cells seen in your preparation. Note: Distinguishing features of different cells. A. RBCs are circular and without nuclei. By changing the focus, you can realise that RBCs are biconcave as the central part is lighter. B. Shape of WBC is irregular. Mainly two types of WBC are found(a) Granulocytes: Granules are found in these cells. These cells are of the following types: • Eosinophils or Acidophils: Its nucleus is trilobed and twisted into an 'S' shape. Laboratory Manual: Biology • Basophils – Its nucleus is bilobed. • Neutrophils – Its nucleus is multi lobed (2-5 lobed). (b) Agranulocytes: Its cytoplasm is without granules and nuclei are non-lobed. These are of the following types. • Monocytes – These are large in size with kidney shaped nucleus. • Lymphocytes – They are slightly bigger than RBC with spherical nucleus. C. Platelets have no nuclei. They appear in clusters as violet granules. Different types of corpuscles present in the blood perform different functions. Haemoglobin present in the (RBCs) help in exchange of oxygen and carbon dioxide. Monocytes and lymphocytes participate in destroying harmful microorganisms that invade our body. Platelets help in blood clotting activity which to a certain extent prevents blood loss during injury. The total counts of RBCs and WBCs and the differential counts of various WBCs are of great medical significance for diagnostic purpose. III MUSCULAR TISSUE A. Striated Muscle Fibres (a) Taking out the tissue • Place a preserved cockroach/frog or other available animal in a dissecting tray containing water. • Cut open the animal to expose its thigh region. (As on alternate preserve sample of striated muscle can be provided) • Take a small piece of muscle from this region and tease it on a slide with the help of needles to get a few thinnest possible fibres. • Wash it in water in a petridish, changing the water 2-3 times to remove the preservative, as it may interfere with staining. (b) Staining and mounting • Add a few drops of methylene blue to stain the muscle fibres. • After staining, put the muscle fibres on a slide and tease it further, if necessary, with needles so that the muscle fibres are well separated. • Blot out the excess of water and stain. • Add a drop of glycerine on the slide and with the help of a needle gently put the coverslip and avoid the entry of air bubbles. Exercise 5 • Press the coverslip gently with a needle to spread the glycerine and the muscles properly. • Examine the slide under the microscope. Look for the following features in the muscle fibre • Muscle fibres are elongated, cylindrical and multinucleated (syncytium). • These fibres are enclosed in a membrane called sarcolemma. • Several dark and light bands are alternately arranged perpendicularly to the long axis of the fibre. Presence of these bands alternately produce striations, hence these muscles are called striated muscles (Fig.5.3a). Draw a labelled diagram of your preparation. Striated muscles constitute the main component of musculature of our body, primarily attached to bones via tendons, hence are also called skeletal muscles. Their contractions are voluntary in nature and thus are not controlled by autonomic nervous system. B. Smooth Muscle Fibre Observe permanent slide preparation of L.S. of wall of urinary bladder showing smooth muscle. Look for the following features: (i) Smooth muscle cells are extremely long and spindle shaped. They have an oval nucleus located centrally in the cytoplasm (Fig. 5.3b). (ii) Sarcolemma is absent. 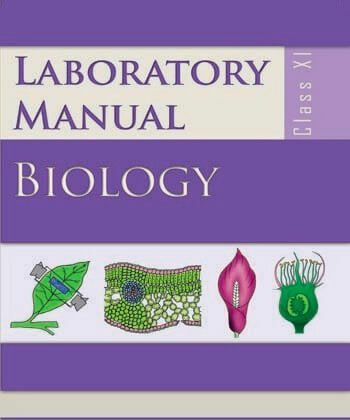 Laboratory Manual: Biology (iii) Since these fibres do not show dark and light bands, they are called unstriated muscles. Draw a labelled diagram of the muscle fibre. Smooth or unstriated muscles are present in the dermis of skin and in the wall of various hollow visceral organs like alimentary canal, urinary bladder, etc. They are usually controlled by autonomic nervous system. Their contraction process is slow and not under voluntary control and therefore they are also called involuntary muscles. C. Cardiac Muscle Fibre Observe permanent slide preparation of L.S. of cardiac muscle. A vertical section of heart may be used. Pay attention to the musculature of its wall. These are cardiac muscles. (i) Faint cross-striations, present both longitudinally and transversely. (ii) Cardiac muscle fibres are branched, uninucleate and much shorter than the striated muscles (Fig.5.3c). (iii) Presence of junctional complexes are characteristic of cardiac muscles. Cardiac muscles are present in the walls of the heart. They are myogenic but are also controlled by autonomic nervous system. They are involuntary in nature, and contract rhythmically throughout life without getting fatigued. Questions 1. Why are epithelial cells compactly arranged? 2. Why it is necessary to remove the first drop of blood from the fingertip while preparing the bloodfilm slides? 3. Why is the pricking needle to be used only once? 4. Why is it necessary to prepare a thin blood film? 5. How will you differentiate platelets from basophils? 6. Why do we call a striated muscle fibre as a syncytium? 7. How many nuclei do you observe in a smooth muscle fibre? 8. Which muscles fibres are branched? 9. Why are stains used while preparing slides?